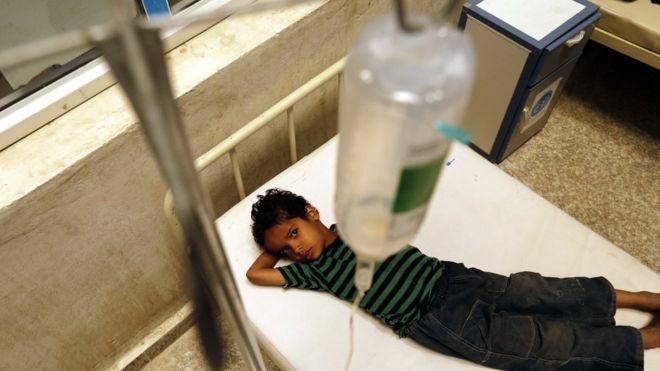 The number of suspected cases of cholera resulting from an epidemic in war-torn Yemen has reached 500,000, the World Health Organization (WHO) says. At least 1,975 people have died since the waterborne disease began to spread rapidly at the end of April. The WHO said the overall caseload had declined since July, but that 5,000 people a day were still being infected. The disease spread due to deteriorating hygiene and sanitation conditions and disruptions to the water supply. More than 14 million people are cut off from regular access to clean water and sanitation in Yemen, and waste collection has ceased in major cities.